After wrapping up his delightful “Harley Quinn meets the New Gods” story arc, Sam Humphries and team deliver a merely humdrum issue with Harley Quinn #48. This book kicks off a short two-part story that will carry the title to its milestone 50th issue. Grounding the story after the space epic that launched his run, Humphries reins in the story to focus on the more mundane aspects of Harley’s day-to-day life. Returning to Earth from her wild adventure through the hell fires of Apokolips, Harley arrives at her secret base – a warehouse on Coney Island – only to find things in shambles. A real-estate developer has hired a demolition crew to tear down her base with the intention of building “Beautiful, gleaming modern townhouses.” As it turns out, Harley neglected to pay her mortgage while gallivanting across the galaxy. Gentrification becomes the crux of the issue when Harley is given two days to rectify the situation or risk losing her warehouse. 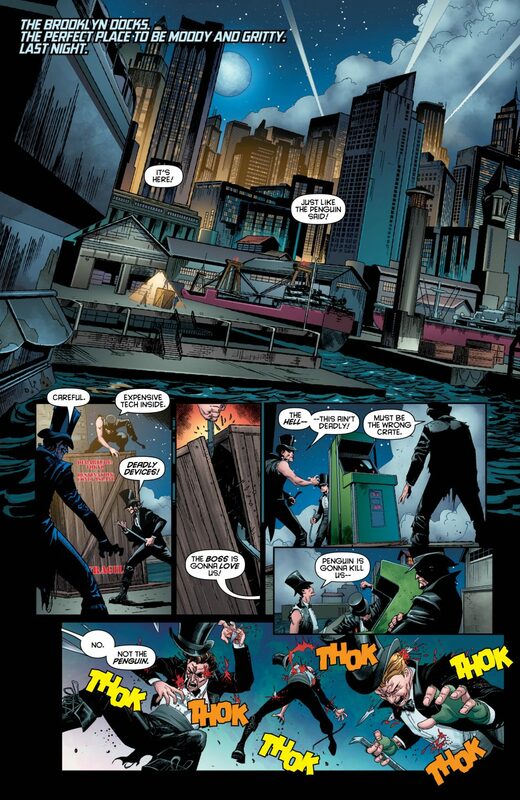 Desperate for funds, our anti-hero responds to an “Assassin wanted” job advertisement, agreeing to carry out a hit on Lord Death Man – one of the more unusual, esoteric villains in the Bat-pantheon. 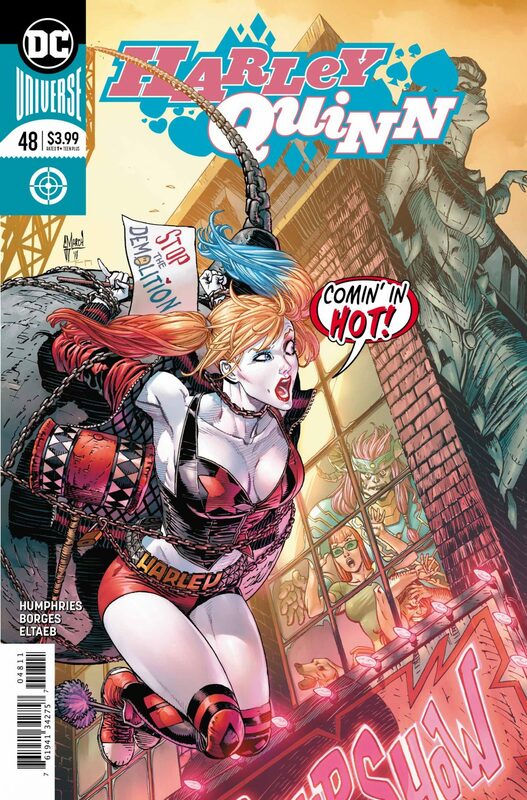 Harley Quinn #48 breaks zero new ground within the series, instead relying on the well-established story elements that fostered the book’s cult following. 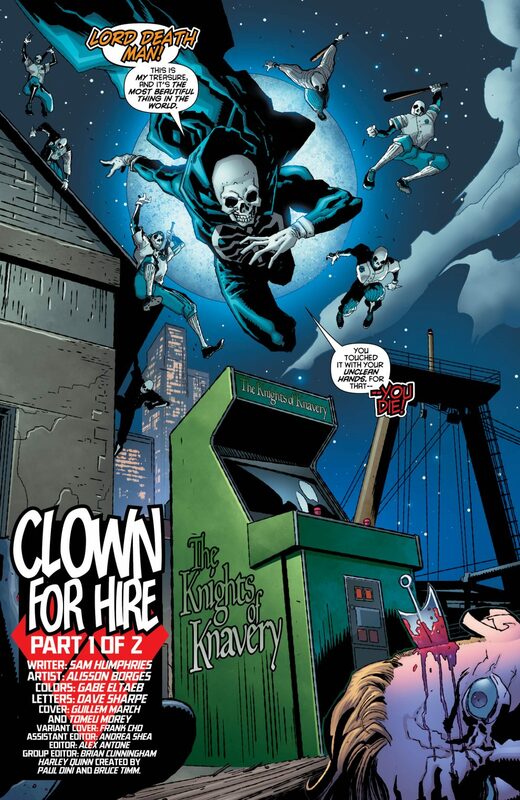 The issue has its fun moments – especially the well-paced montage showing Harley failing at a variety of odd jobs before deciding to become an assassin. Lord Death Man’s inclusion is also a nice touch, as his eccentric persona compliments the title’s zany tone. However, this meat-and-potatoes issue lacks the magic of the most recent arc. Humphries’ previous fun, fresh tale took Harley out of her normal environment and plopped her in the middle of the perpetual cosmic opera of the New Gods. 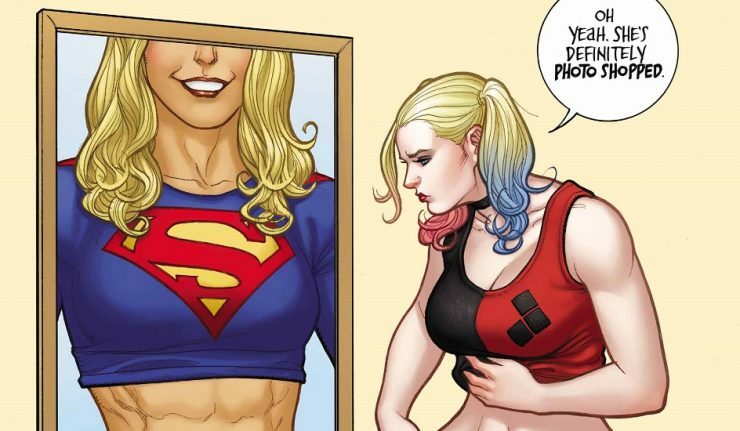 By comparison, Harley Quinn #48 is generic in its content and execution. Frankly, this back-to-basics issue feels more like filler than anything else, written with the intent of simply carrying the title to its 50th issue. Alisson Barges’ pencils are in keeping with DC’s prescribed “Loony Tunes” style for Harley Quinn – a style well established by the title’s godmother, Amanda Connor. Nevertheless, this adherence to Connor’s vision for the book is one of the issue’s flaws. Like Humphries’ script for this issue, which offers little in the way of freshness, Barges’ work is imitative instead of inventive. Although perfectly serviceable for the task at hand, her pencils are unmemorable. 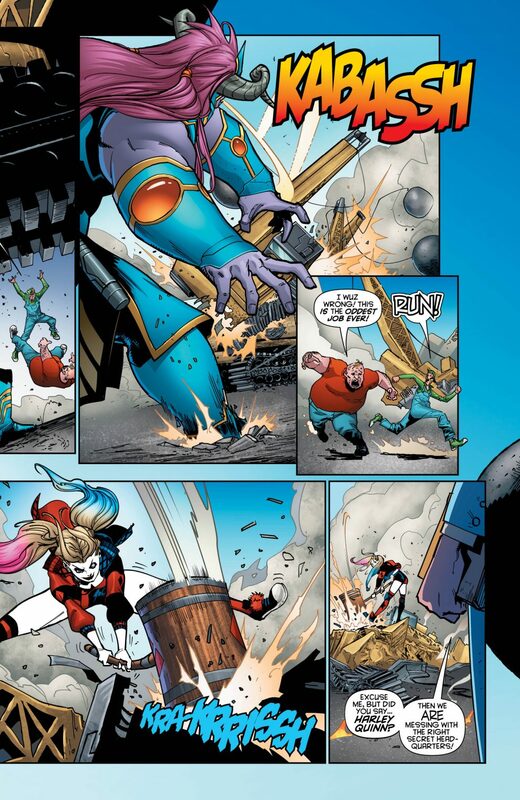 Overall, Harley Quinn #48 is unremarkable – forgettable, even. 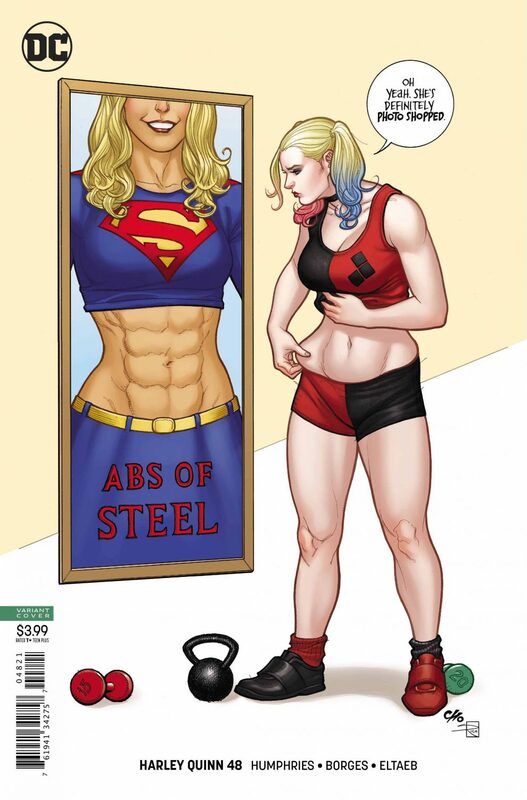 For those who love the title, this issue will scratch their Harley itch. It does what Harley Quinn normally does – but not much else. Sam Humphries and Alisson Barges serve up the same meal that made the title appealing in the first place. However, after five years of same ole same ole, this dish is starting to taste a bit stale. Bryant Lucas is a Staff Writer at Dark Knight News. Bryant has been collecting comics for over a decade but has been a fan of DC since he was a child. Bryant works as a high school English teacher in Houston, TX, where he lives with his wife and two children. Bryant has a MA in English and American Literature from the University of Kent in Canterbury, UK.